Some of our more keen eyed fans may have noticed there was a very important piece, the DT machine gun, was missing from the BA-64 that we revealed last week. This week we are showing off the infantry version of the DT; the DP-28 light machine gun! Nicknamed the 'Record Player' by the Soviet army, the DP was a cheap and reliable machine gun that started out in 1928. It quickly gained a reputation for being able to withstand sand and mud, and still come out able to fire off more than 500 rounds. The DP did have its share of drawbacks however. The bipod was weak and was unable to handle the abuse of firing the large 7.62mm rounds. Another problem came from the distinctive pan-style magazine on top. Capable of only holding 47 rounds, the DP was less effective at sustained fire than its belt-fed counterparts, since re-loading each magazine took so long. The DP saw Soviet front line service from 1928 to 1960, with approximately 795,000 made, including many sub-variants and licensed remakes. 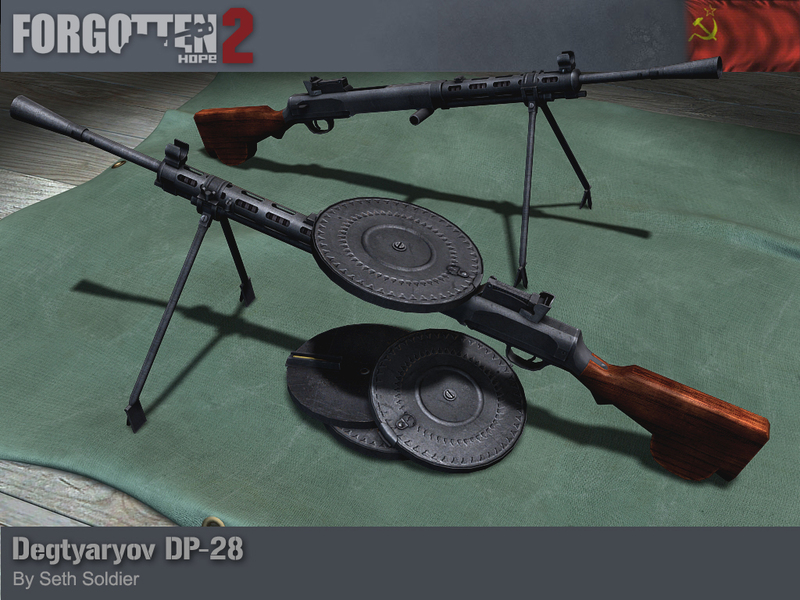 The DP-28 was made by Seth Soldier. On a final note, we would like to thank everyone for their participation in the first ever, Screenshot of the Week competition. We had many submissions, but in the end we could only pick one. This week's winner was JackONeill. You can check the sidebar on the right to view the winning pick. A special thank you to MayhemicMAD for implementing this new feature. As this is a weekly contest, submissions for the next week are now open! Look here for rules on submitting your best screenshots! Hello and welcome back to another update of Forgotten Hope 2. This week's update is somewhat of a special one. Not only is today's render of a prominent vehicle in Forgotten Hope history, but we are also announcing the start of a new weekly screenshot contest. Enjoy! Our render for today is of a vehicle that holds the title of being the first creation for the original Forgotten Hope modification - the BA-64B! The BA-64 was a small, lightly armed, 4x4 armored car that was used by Soviet armies primarily for reconnaissance and liaison tasks. Nicknamed 'Bobik', the BA-64 was armed with only a DT light machinegun, and suffered from a lack of any major weapons. However, this did have its advantages. 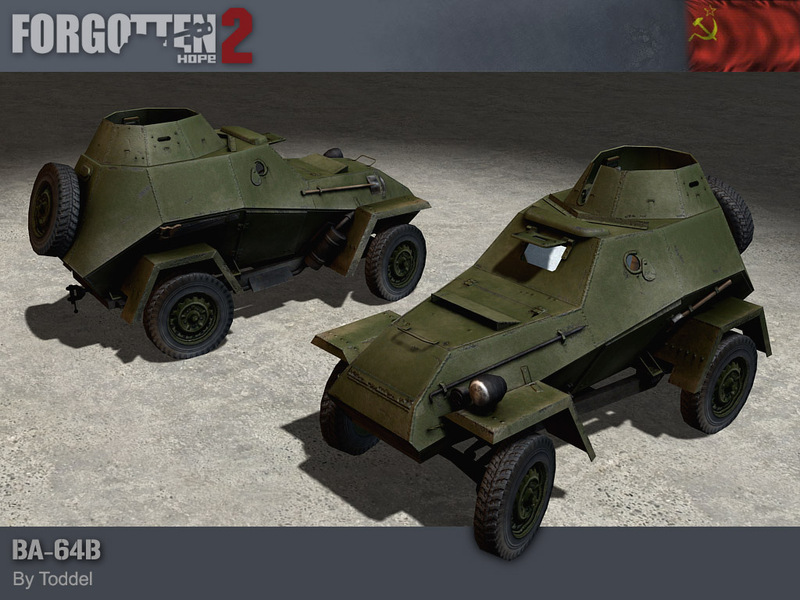 Combined with excellent maneuverability and speed, these nimble scout cars saw large success in urban combat. BA-64s were even able to fire on enemy soldiers hiding on the top floors of buildings and low-flying aircraft since the gun was able to be elevated so high. The BA-64 was produced from 1942 - 1946, with an estimated 9,110 made. The BA-64B was created by Toddel. Since the initial release of Forgotten Hope 2, players have been taking and sharing screenshots all across the internet. Well now there is a way to put your photography skills to work. With the start of this week we are making known a new weekly contest - the Screenshot of the Week! Starting today, we will be accepting one screenshot submission from anyone who wants to participate. At the end of the week, the best one will be picked, and featured on our website for one week. You can look here for all of the rules and submit your screenshots. Lastly, we would like to let everyone know that the monthly Forgotten Hope Game Night (FHGN) is almost upon us! Be sure join your fellow players on Sept. the 24th at 18:00 GMT for some intense FH2 action! A quick 'thank you' to the Forgotten Honor tournament for hosting the server. See you out there! Hello and welcome back to another update of Forgotten Hope 2. Along with several announcements, this week's update will feature a render of a brand new German support weapon. Enjoy! Our first and only render for today is of the largest weapon ever to be classified as an infantry gun. It is the 15cm schweres Infanterie Geschütz 33 (sIG 33)! The sIG 33 was essentially a 150mm artillery gun, which was designed to provide close-range, supporting fire to infantry units. The gun itself was of conventional design, with large wooden, and then later, steel wheels. It also features included solid rubber tires, an air brake, and could fire a host of ammunition including HE, smoke, hollow-charge rounds. The most interesting however, was the Stielgranate 42 round, which consisted of a finned projectile still attached to the driving rod. Its primary use was not as an anti-tank round, but as a demo charge for clearing various strongholds. From 1936, all the way through to the end of war 1945, approximately 4,600 sIG 33s were produced. 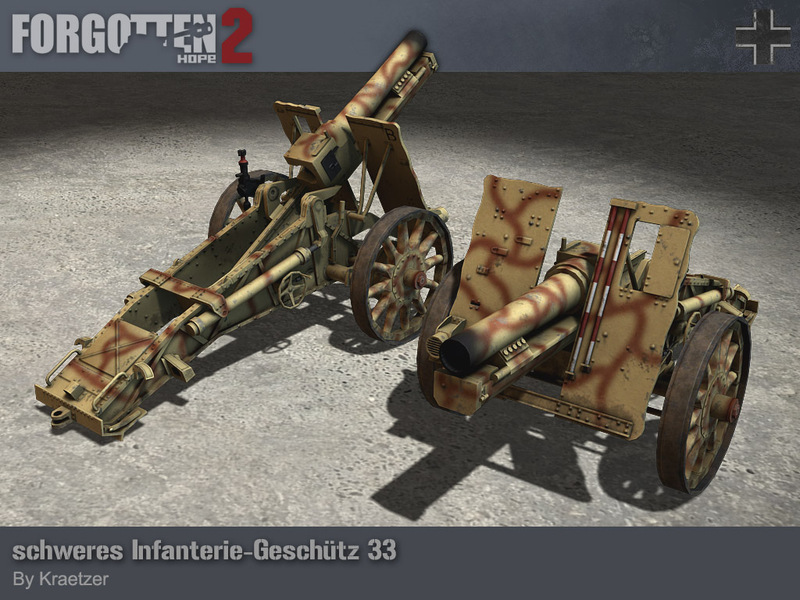 The 15cm schweres Infanterie Geschütz 33 was made by Kraetzer. Yesterday, on Saturday the 10th, our awards and stats system began tracking our 10,000th player! This is quite and accomplishment for us on the development team, and we'd like to thank all of our fans for their support! We would also like to let everyone know that the next FH Game Night is coming up later this month, and will take place on the 24th of September. While this is still a few weeks off, you can vote for which maps you'd like to play here, and be sure to check our forums for more information. 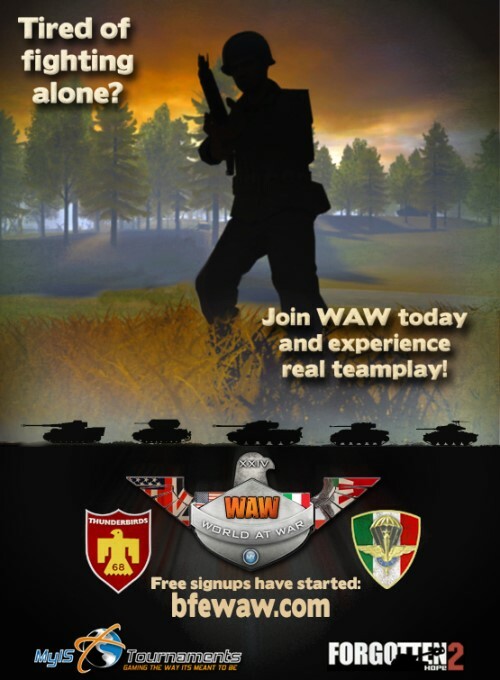 The World at War Tournament has just opened signups for its 24th campaign of organized, coordinated and teamwork based FH2 combat. Sign up to the Italian 67ª Divisione paracadutisti "Folgore" or the US 68th Infantry Division "Thunderbird" and become part of a real team with players from across the world who love teamwork, just like you. Fight and train alongside your buddies every week using TeamSpeak 3, custom WaW equipment and gameplay features such as great naval combat, new aircraft, weapons, vehicles, and many different custom maps. All this without the obligations of a clan! Epic 64-player 11-hour battles every Saturday. Fight when you want, for as long or as little as you want. Start as new recruit and work your way up the historical ranks to fight and lead as an NCO or even an officer. Be rewarded with authentic medals and badges through skill, dedication and teamwork on the battlefield. Communicate and coordinate with your buddies using Teamspeak 3 and diverse strategies and tactics. Do your bit for your army! Contribute to each battle and to overall victory. Achieve something together. It's completely free and it's a lot of fun! The World at War Tournament has been providing some of the best organized gameplay on the battlefield platform for over 8 years with a mixed community from across the globe. Friendly and welcoming, our members make it easy to integrate without the obligations of a clan. Experience camaraderie seldom found in gaming and an atmosphere that will keep you coming back for more for years to come! The World at War Tournament invites you to take part in a another special event: Naval & Air Combat using Forgotten Hope 2.4. It's a public event open to everyone. The server is not passworded. TeamSpeak is not required. The last Air/Navy events were a great success. Since the release of FH2.4 our modders have been hard at working adjust our custom vehicles and making everything compatible. It's been almost two months since our last public event and it's time to get to do it again! Take to sea and experience the awesome firepower of might ships such as the H.M.S. Hood and Prinz Eugen. Take the helm and command the ship and her guns or defend her against air attack by using the many anti-aircraft batteries. Counter the heavy ships with Cruisers, destroyers, PT boats, Schnellboats, or stalk your prey from the depths with Submarines. Seasick? Don't worry. Sink those beasts from the air with torpedo bombers or from Coastal gun emplacements. Had enough of ships and want to hit the beach? Grab a landing craft off the back of a destroyer and take the fight to the enemy with your squad! Special thanks to the guys behind FH1, as most of the FH1 ships and aircraft are imported and recoded by our modders to work with FH2. Tyrrhenian Sea: Fight for control of the sea amongst small islands using heavy air support. Sea of Aland: Epic naval and aerial engagement in the middle of the ocean. Supplies for Malta: Win the map by escorting a convoy of supply vessels to the port of Valletta against heavy German raids. Wake Island: Relive the classic BF1942 map in all its glory with naval, land and air assets. Battle of the Atlantic: Protect the Atlantic Convoy from the might of the Kriegsmarine and her Wolfpacks. ongoing all of September 2011. Our Public server is running the maps all the time. 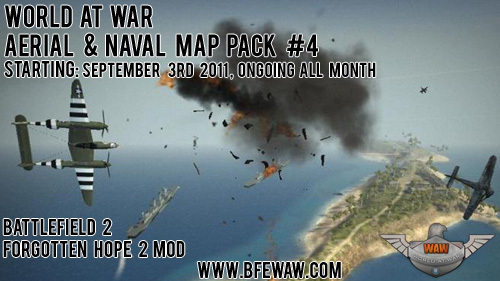 Join the channels: "WaW Naval Event" at the top of TeamSpeak. Hello and welcome back to another update of Forgotten Hope 2. We are back with our second update of the week, and today the Soviets will be receiving some much needed support in the way of small arms and explosives. Enjoy! In the render below you can see the two weapons we are revealing today. They are the PPS-43 submachine gun and the F1 grenade. The PPS family of submachine guns (SMGs) started out in 1942 in the form of the PPS-42. It was primarily designed to be a lightweight, compact weapon to be used by various Soviet reconnaissance teams, vehicle crews, and support personnel. In 1943, after a production run of 45,000 units, the PPS-43 came into service with several design changes. Some of the more notable changes included a ventilated heat shield in the upper receiver and a shortened barrel and stock. The PPS-43 went on to be used throughout the rest of the war and was produced up until 1968. It still can be found in use today by some smaller nations. The Soviet F1 hand grenade (nicknamed "Little Lemon") was a small, defensive fragmentation grenade. Introduced during World War II, the F1 was based on the existing French grenade of similar design and featured 60 grams of TNT. Its estimated throwing distance was somewhere between 30-45 meters, and could disperse metal shrapnel up to a distance of 200 meters. Thus the grenade had to be used from a defensive position to avoid injuring any nearby friendly troops. 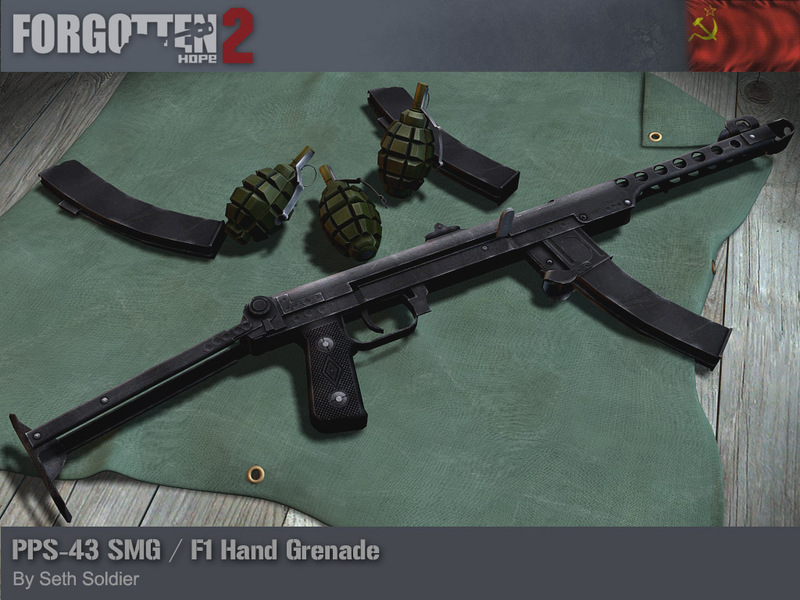 Both the PPS-43 submachine gun and the F1 hand grenade were made by Seth Soldier.